I’ve always loved dragons ever since I was a kid and this love or rather obsession has led me to build several dragon masks which I then usually auction off to other enthusiasts. 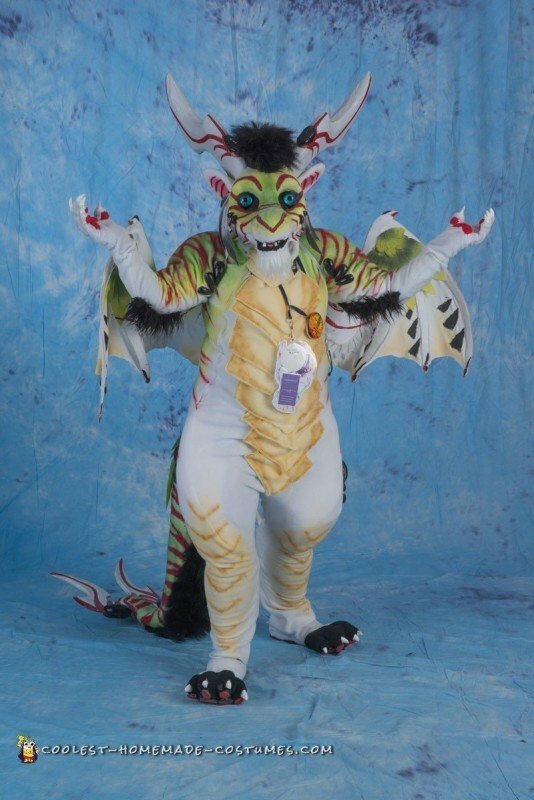 However, I never made a dragon that was solely mine or a full body to go along with the mask. So with the help of a few friends, I designed Koshrakus or Kosh for short and set off on building him. 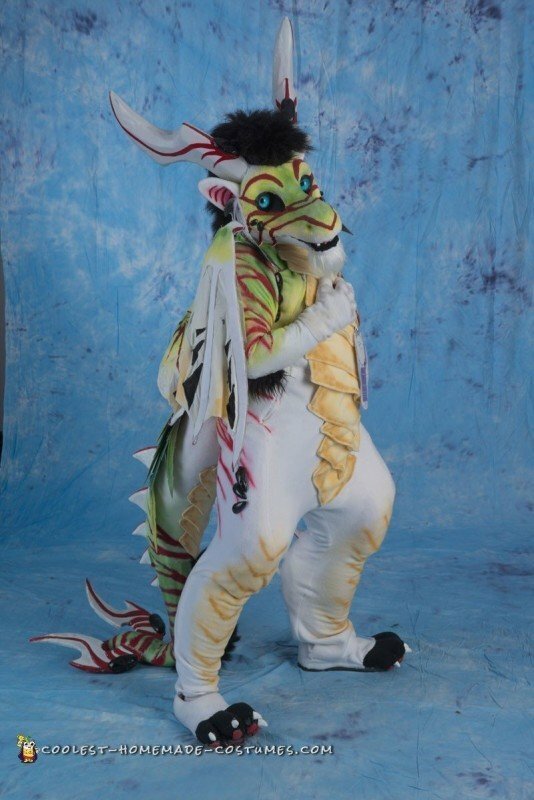 I started with the body, I created a duct tape dummy of my body and using foam carved out the shape I wanted, once I was satisfied, I covered the entire thing in fleece and then painted it through a combination of airbrushing and dry brushing. The hands were fairly simply I traced my hand onto some drafting paper and made a pattern for the gloves that way, the feet were made similar to the body and built on top of a pair of old running shoes. The tail’s shape was achieved by carving out a solid block of foam than putting fleece over it. After the tail was skinned and airbrushed, I detailed it by making feathers (thick felt), fins (EVA foam), and spikes (Wonderflex). The fur/hair accents in the body, head and tail were made using a method called hand wafting – it’s where you tie/braid together many small strands of hair until you have larger braids which you then weave together. It’s very tedious, but the results are quite worth it. For those curious, the “hair” fibers I used were Kanekalon. The head was a fun challenge which I started out by sculpting the shape I wanted out of clay and then making a mold out of it which I then cast out of resin. I created custom hinges for the head so I could get an articulated jaw that would open as mine did. 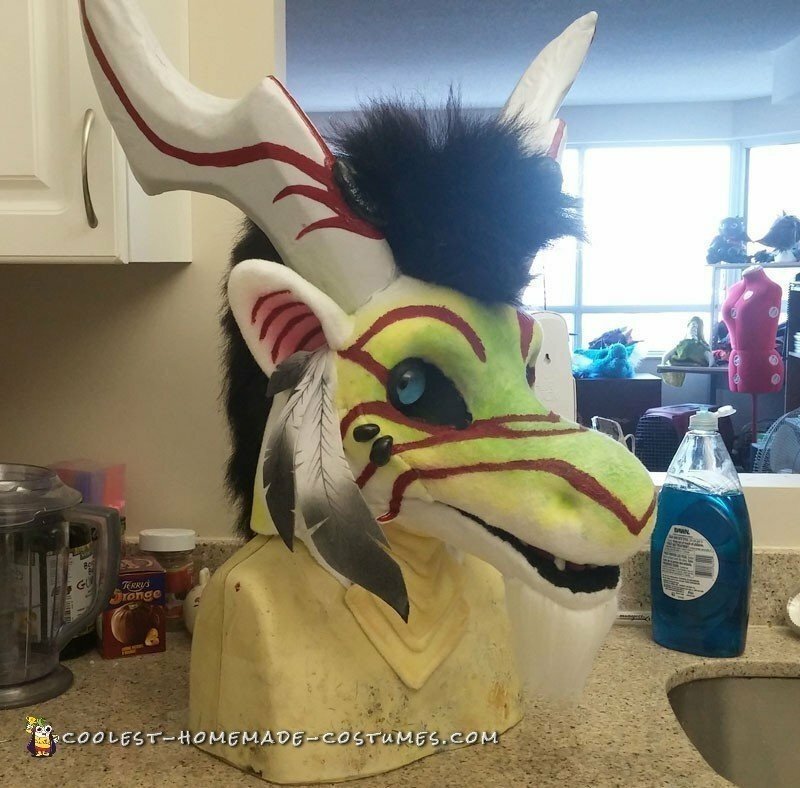 The entire head was then skinned, airbrushed and detailed in a manner similar to the rest of the suit. The eyes and gems were all cast out of resin and then hand painted. I could see out through the ‘tear ducts’ (the black mesh beside the eyes). 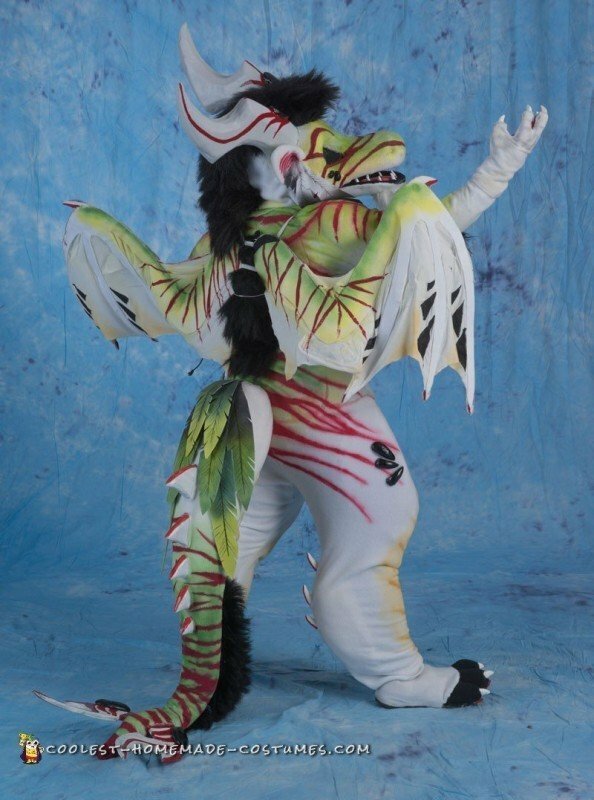 Lastly the wings, oh goodness these wings gave me a lot of grief and one day I would like to remake them as I am not satisfied with them at all. For the wings I started by building an armature, normally one would build it out of wire but since I wanted something flexible without being delicate, I went with the corset boning which I then reinforced with the same sturdy felt I used on the tail, stretched nylon over it, added EL wire (so the wings could light up) and airbrushed it. Since I worked on this suit on and off over a period of roughly 6 months I could not tell you how long it actually took to make. Similarly, I’m unsure about the cost but I estimate around 500$ which is inexpensive when one considers that suits like these tend to cost in the thousands to buy. It is my dream to one-day build costumes for a living, but for now though, it is just an expensive hobby.